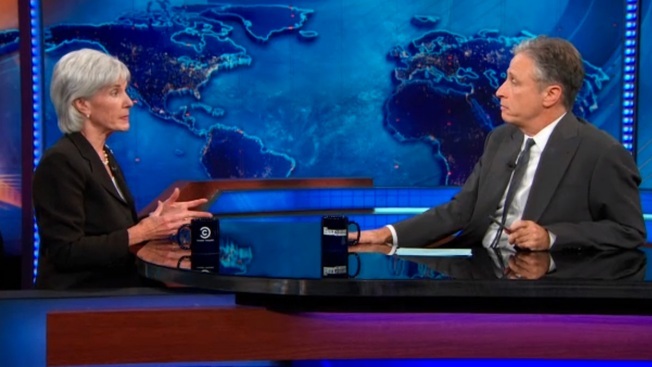 Secretary of Health and Human Services Kathleen Sebelius and "Daily Show" host Jon Stewart spar over Obamacare. "I'm going to try and download every movie ever made, and you're going to try to sign up for Obamacare and we'll see which happens first," Stewart joked as he opened a laptop on his desk and welcomed Sebelius on the show. Sebelius said she couldn't say how many people had actually enrolled for health insurance, but that hundreds of thousands of peoples had created accounts to access the online health exchanges. Stewart then asked why businesses with more than 50 employees were exempt from a penalty until 2015 if they did not provide all of their employees with health insurance, while individuals without health insurance will be assessed with a fine once the law goes into effect in 2014. Sebelius responded and said that 95 percent of those businesses are already in the health market. "A delay doesn't change the market numbers," she said. But Stewart kept pressing the issue. "It would be hard for me to look at a big business getting a waiver and not having to do it, and me having to, because I would think..it looks like…I would feel like you were favoring big business because they lobbied you to delay it because they didn't want to do it this year, but you're not allowing individuals that same courtesy," Stewart said. The back-and-forth between Stewart and Sebelius continued with the secretary defending the new health law and all of the new systems it put in place, showcasing that consumers will for the first time be able to compare health plans side-by-side and pick and choose which would be best for them. When Stewart asked why people couldn't opt out of getting health insurance, she said they could, but pay a fine because someone couldn't predict their health circumstances. "For a lot of young folks, they're one fall on the basketball court, one auto accident away from a lifetime of hospital bills they can't pay," Sebelius said. The debate over the health care law continued with Stewart slightly softening his tone explaining his apparent objection to the new health care law. He and Sebelius continued to spar over certain facets of the law. But to cap off the interview, Sebelius assured Stewart that the online health exchanges were getting better with each passing day. "It's better today than it was yesterday and it will continue to get better," she said.